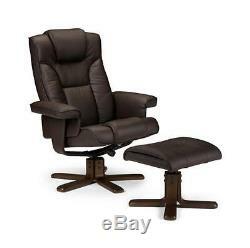 MALMO Ergonomic Office Recliner Chair + Footstool Brown / Black Faux Leather. Faux Leather Reclining Malmo Swivel Chair + Footstool. Available in Deep Chocolate Brown or Black. This stylish reclining swivel chair, provides comfort for working at your desk or sat watching TV. The Malmo reclining swivel chair and stool is upholstered in a soft touch faux leather with a walnut colour laminated base. It offers the ultimate sitting comfort and relaxation. Dimensions: Chair - W83cm X D82cm X H105cm / Footstool - L44cm X W44cm X H40cm. This listing includes the chair and matching footstool. This item comes flat packed for simple home assembly, all tools and instructions included. Please be advised that mattresses may be delivered rolled. This will not affect the quality of the product. To ensure your new furniture is suitable for your home, please remember to measure your available space before ordering. Ergonomic adjustable manual swivel recliner with matching footstool. Height is not adjustable - from floor to top of seat cushion is 44cm. Comfortable and strong, finished in Black or Chocolate Faux Leather. Very stylish and will blend into any home or office environment. Simple home assembly - 2 people recommended. Over the past few years we have been developing our range of products to enable us to supply consumers with furniture at the absolutely lowest prices possible. We do not have the large overheads that shops and large retail chains have so we can keep our prices low and pass all the savings onto our customers. Cloud Nine Furniture prides itself on its excellent prices and customer service. The office is closed at weekends and bank holidays. We only deliver to the UK. Unfortunately we are UNABLE to give more specific time slots. Messages sent on Fridays/Weekends will be responded to on Mondays (Bank Holiday exceptions). Please do not send DUPLICATE messages as this duplicates our work and adds to the message response time. All messages are responded to in time and date order, thank you for your patience. Please note the courier drivers are not insured to carry items upstairs/into a property. The more info you supply us with the quicker we will be able to rectify the issue. Please however beware of the following. Mattresses, Chair Beds and Beds. As with nearly all mattress retailers we are unable to accept "used" mattresses for return for health and hygiene reasons. By "used" we mean mattresses that have been removed from their original packaging. Flat packed furniture As with nearly all furniture retailers we are unable to accept flat packed furniture that has been erected or semi-erected. We will then be able to assist you in either sending replacement parts or a new product. This listing is currently undergoing maintenance, we apologise for any inconvenience caused. The item "MALMO Ergonomic Office Recliner Chair + Footstool Brown / Black Faux Leather" is in sale since Friday, December 09, 2011. This item is in the category "Home, Furniture & DIY\Furniture\Chairs".